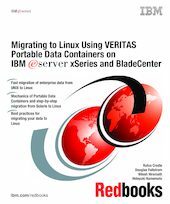 This IBM Redbooks publication discusses Portable Data Containers. Portable Data Containers are a tool that allows customers to migrate their applications from UNIX to Linux more seamlessly. They are a part of VERITAS Storage Foundations 4.0. With Portable Data Containers, a customer can migrate an application without moving that application's data. This book describes the concepts of storage management and the key features of VERITAS Storage Foundations 4.0 and . In addition, it discusses a number of considerations that you should review prior to a UNIX to Linux migration, and then takes you through a step-by-step migration from Solaris to Linux. It discusses the performance and scalability of Portable Data Containers and compares the throughput of Portable Data Containers with theoretical network throughput and disk transfer speeds. Finally, this book includes best practices for migrating applications to Linux using Portable Data Containers. In particular, it identifies the steps that are required to migrate an Oracle or DB2 database from a UNIX server to a Linux server. With this knowledge, customers can accelerate their migration plans to Linux to take advantage of the cost benefits provided by the open-source operating system. The audience for this book are IBM Clients and Business Partners as well as IT specialists and database administrators.